Would an anti-hopping law be effective? In 2009, a political crisis gripped the nation with the collapse of the Pakatan Rakyat government in Perak. The fall was triggered by three Pakatan lawmakers quitting their respective parties and declaring support for the BN state opposition. Ten years later, several states are seeing similar incidents following regime changes in the 2018 general election. 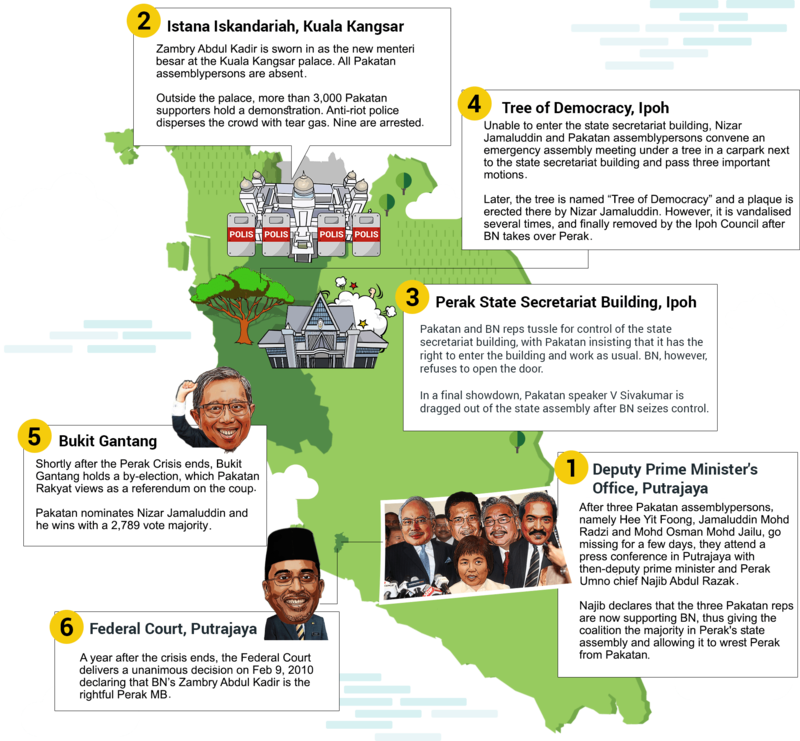 In conjunction with the 10th year anniversary of the Perak crisis, Malaysiakini presents here a series of special reports. After three Pakatan assemblypersons, namely Hee Yit Foong, Jamaluddin Mohd Radzi and Mohd Osman Mohd Jailu, go missing for a few days, they attend a press conference in Putrajaya with then-deputy prime minister and Perak Umno chief Najib Abdul Razak. Najib Abdul Razak declares that the three Pakatan reps are now supporting BN, thus giving the coalition the majority in Perak's state assembly and allowing it to wrest Perak from Pakatan. Zambry Abdul Kadir is sworn in as the new menteri besar at the Kuala Kangsar palace. All Pakatan assemblypersons are absent. Outside the palace, more than 3,000 Pakatan supporters hold a demonstration. Anti-riot police disperses the crowd with tear gas. Nine are arrested. Pakatan and BN reps tussle for control of the state secretariat building, with Pakatan insisting that it has the right to enter the building and work as usual. BN, however, refuses to open the door. In a final showdown, Pakatan speaker V Sivakumar is dragged out of the state assembly after BN seizes control. Unable to enter the state secretariat building, Nizar Jamaluddin and Pakatan assemblypersons convene an emergency assembly meeting under a tree in a carpark next to the state secretariat building and pass three important motions. Later, the tree is named “Tree of Democracy” and a plaque is erected there by Nizar Jamaluddin. However, it is vandalised several times, and finally removed by the Ipoh Council after BN takes over Perak. Shortly after the Perak Crisis ends, Bukit Gantang holds a by-election, which Pakatan Rakyat views as a referendum on the coup. Pakatan nominates Nizar Jamaluddin and he wins with a 2,789 vote majority. A year after the crisis ends, the Federal Court delivers a unanimous decision on Feb 9, 2010, declaring that BN’s Zambry Abdul Kadir is the rightful Perak MB. This guide was brought to you by the Kini News Lab. If you like what we do, consider subscribing to Malaysiakini and support media independence. Lu Wei Hoong, Lee Way Loon, Cheong Wey Jin, Al-Abror Mohd Yusuf, Aedi Asri Abdullah, Andrew Ong, Rusnizam Mahat, Lim Zhi Wei (Intern), Sean Ho, Syariman Badrulzaman, Thiaga Raj.